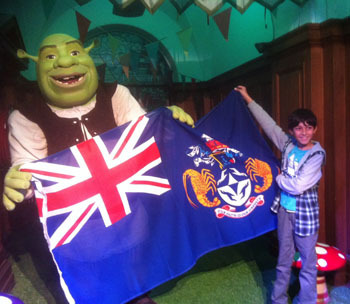 Below left: A rare wet day in London showing the Swain family beneath the Tristan flag flying in their honour in Parliament Square (perhaps the visit of the President of China may also have had something to do with it). 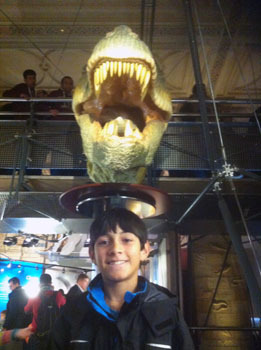 provides the photo of the tour so far! 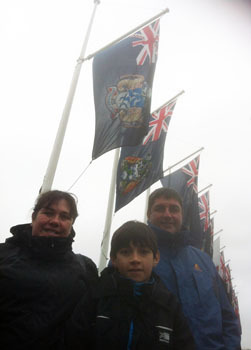 The family took a River Thames cruise to Tower Bridge to get to The Tower of London. 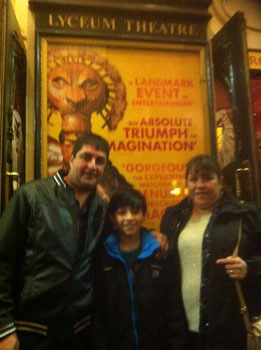 Later Chris Carnegy took them to see the musical Lion King at the Lyceum Theatre. 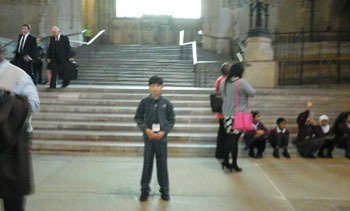 Chris' photo taken outside the theatre shows Mark, Nathan and Paula preparing for a special evening. 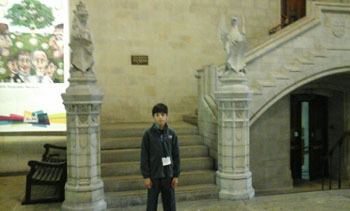 Tristan Desk Officer Jonathon Brown organised a day visiting the Foreign and Commonwealth Office and Westminster Abbey. 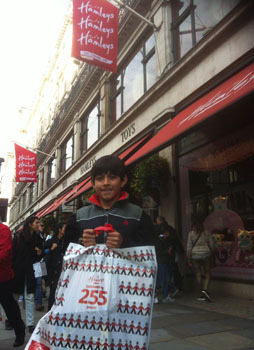 We will add photos when available. 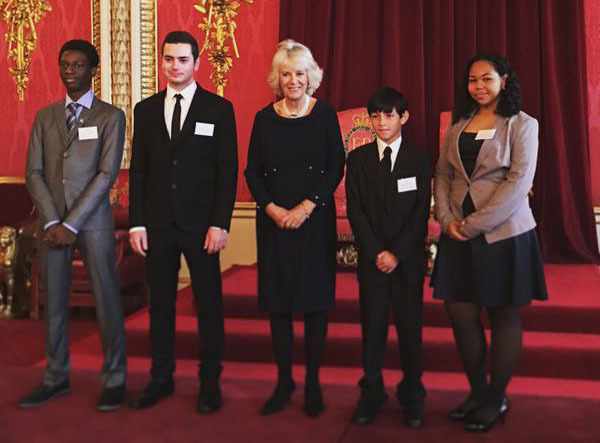 Left to right: Paula, Nathan, Gwynneth, John and Mark. 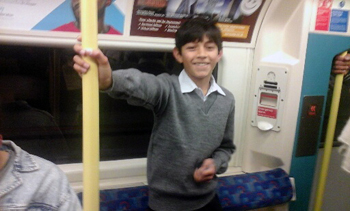 Earlier the group attended a local Church service and later John returned the family to their London hotel by train ready for their final few days in the capital. 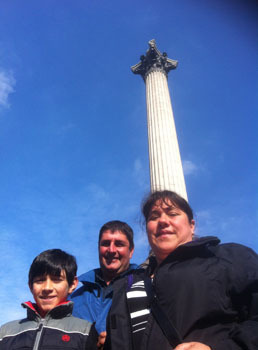 It is the first time the Swain family have been to the UK, or been on a plane. 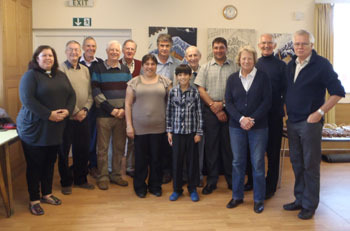 John and Gwynneth Cooper drove the family to Old Marston Church Hall near Oxford where they attended a Reception in honour of Nathan's achievement to coincide with a committee meeting of the Tristan da Cunha Association. 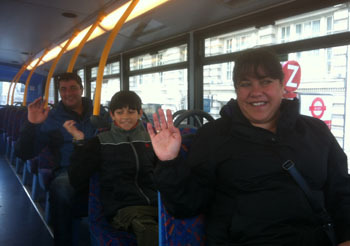 Gwynneth took the family by bus into central Oxford in the morning and they returned in time for lunch. 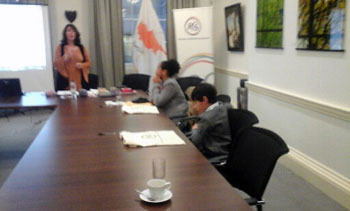 Left: Nathan alongside Tristan Islander Rev Lorna Lavarello-Smith (both on their phones) with Paula and Mark behind. Mike Hentley and Keith Schurch. 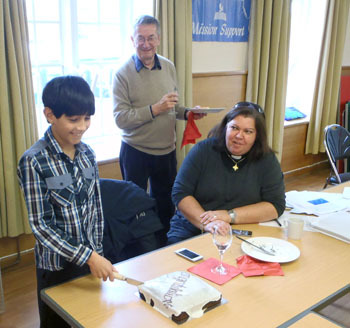 Nathan cutting the 'Congratulations' cake made by Gwynneth Cooper with Rev Lorna Lavarello-Smith alongside and Brian Frederick looking on behind. 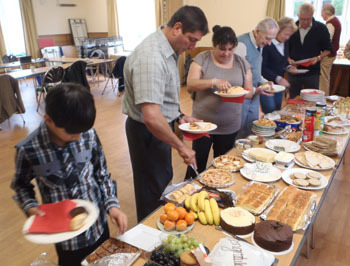 Following the Tristan tradition the buffet was provided by those attending and included home made cakes, savoury tarts and other savouries. 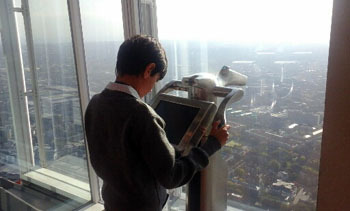 The family had a free day in London during which they went on the London Eye. In the afternoon they were met by their weekend hosts John and Gwynneth Cooper who took them by train to their Surrey home. 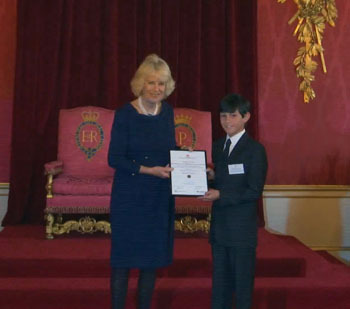 Right: Camilla, Duchess of Cornwall, presents Nathan Swain with his certificate as the Winner of the 2015 Queen's Essay Competition run by the Royal Commonwealth Society in Buckingham Palace. 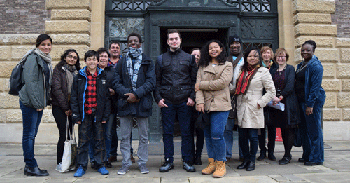 Photo right shows the group including Nathan, Paula and Mark Swain (3rd-5th left) during their visit to Cambridge organised by the Cambridge University Press who sponsored the competition. 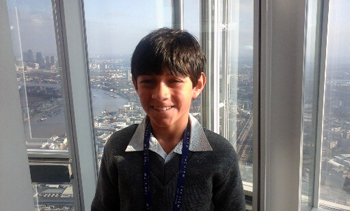 on The Shard - on top of London!!! 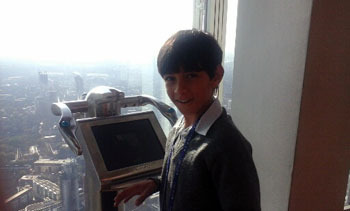 Photos from Chris Carnegy who met the family and looked after them during their amazing first day in the big city. 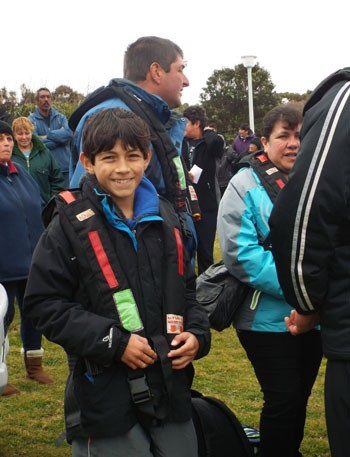 Nathan, Mark and Paula Swain left their home on Thursday 1st October, boarding a helicopter on the American Fence helipad (also the St Mary's School playing field and cattle pasture) to be flown to the awaiting SA Agulhas for the 2810 km or 1750 mile journey to Cape Town, likely to take at least five days. 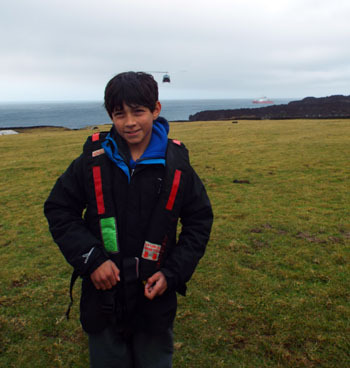 Above - Nathan with SA Agulhas II at anchor and the helicopter in flight coming in to land. 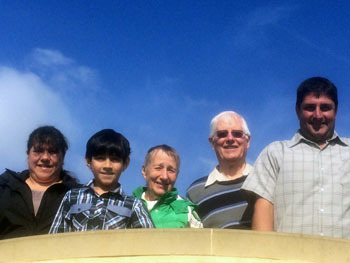 The family will travel by train from Waterloo to Gillingham in Dorset, and continue by road to Somerset to stay with Richard and Margaret Grundy (Richard taught both Mark and Paula in the 1980's and is now Newsletter and Website Editor). On Friday 23rd they will visit Lyme Regis where they will tour the Lyme Regis Boat Building Academy. 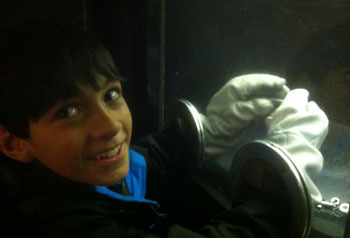 Nathan's essay describes his ambition to become a carpenter like his father, and to build boats. Here is an opportunity to see traditional boat building in wood in a modern context. The family will travel by train to Norfolk via London to stay with Ann and Alan Ashworth, who the family know from their visits to Tristan. 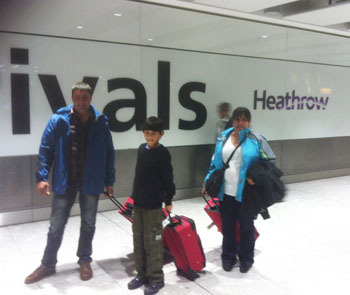 The family depart London Heathrow for Cape Town where they arrive back on Tuesday 3rd November. MV Baltic Trader is the last scheduled ship to Tristan da Cunha in 2015. It will carry the Christmas mail, precious fresh fruit and vegetables, and hopefully Nathan, Mark and Paula to return home about 26th November, no doubt full of memories as they prepare for Christmas.